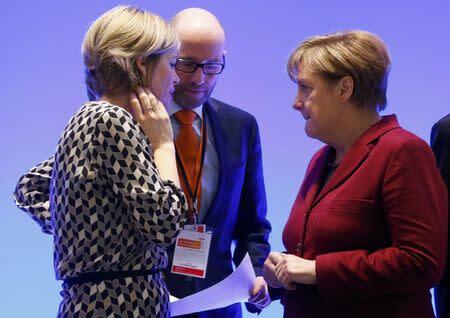 KARLSRUHE, Germany (Reuters) - Chancellor Angela Merkel said on Sunday she wanted to "drastically decrease" the number of refugees coming to Germany, signaling a compromise to critics of her open-door policy from within her conservatives on the eve of a party congress. 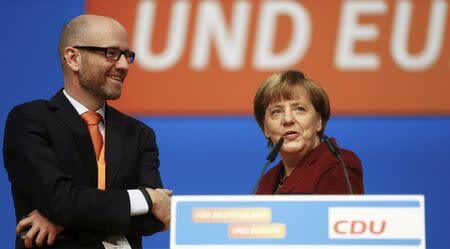 Merkel has resisted pressure from allies within her Christian Democratic Union (CDU) to put a cap on the number of refugees entering Germany, which is expected to top 1 million this year. "At the same time we took on board the concerns of the people, who are worried about the future, and this means we want to reduce, we want to drastically decrease the number of people coming to us," Merkel told broadcaster ARD. 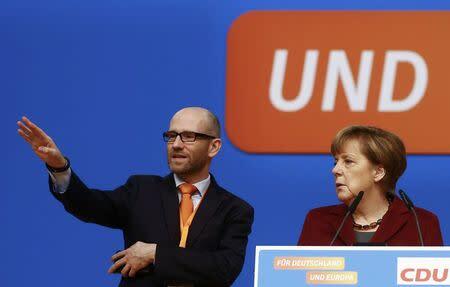 Merkel, whose popularity has fallen over her handling of the refugee crisis, said the word "limit" did not feature in the CDU's main resolution which will be debated at the two-day party congress starting on Monday in the southern city of Karlsruhe. This included working with Turkey to fight traffickers, improving the situation at Syrian refugee camps in Turkey, Lebanon and Jordan, and strengthening control of the European Union's outer borders. Merkel's conservative critics want her to get the number of arrivals down before three state elections in March and say her hopes of running for a fourth term in 2017 would be in danger.